The Constitution of the Late Roman Empire was an unwritten set of guidelines and principles passed down mainly through precedent. 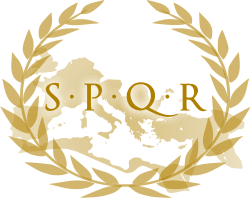 The constitution of the Roman Principate (the early Roman Empire), which was established by the emperor Augustus in the 1st century BC, had governed the "Roman Empire" for three centuries. 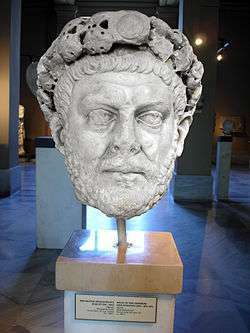 Diocletian became emperor in 284, and his reign marked the end of the Principate and the beginning of the "Dominate" (from Latin dominus: "Lord" or "Master"). The constitution of the Dominate ultimately recognized monarchy as the true source of power, and thus ended the fiction of shared power between the "Roman Emperor" and the "Roman Senate". After Diocletian had reorganized the superstructure of the constitution, he then reorganized the administrative apparatus of the government. When Diocletian abdicated the throne in 305, the Empire quickly descended back into chaos. After the chaos had subsided, however, much of Diocletian's constitution remained in effect. His division of the Empire into west and east, with each half under the command of a separate emperor, remained with brief interruptions of political unity. The capital of the Western Empire was never returned to Rome, the Senate and executive magistrates continued to function as Diocletian's constitution had originally specified, and Diocletian's civil and military divisions of the empire remained in effect. Later emperors, especially Constantine the Great, and Justinian modified Diocletian's constitution. Chief among these court officials was the Imperial Chancellor ("magister officiorum"). 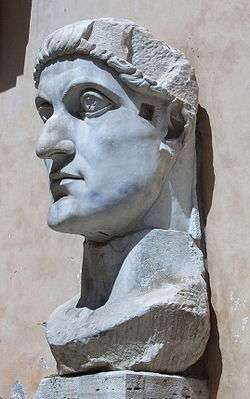 Created by Constantine the Great in 320 AD, the Chancellor functioned as the head of government for the Empire. Ranked as a Count of the Empire, the Chancellor oversaw the entire civil service. The Chancellor's portfolio include a significant number of functions handled by modern government officials. The Chancellor was responsible for conducting court ceremonies and regulated audiences with the Emperor. All correspondences with foreign powers were sent by and embassies of foreign powers to the Emperor were received by the Chancellor. The Chancellor commanded the Imperial Intelligence Service ("Agentes in rebus"), who handled communications between the Emperor and provincial governments as well as gathering intelligence as the Emperor's secret police force. The Chancellors also oversaw the Imperial Transportation Service ("Cursus publicus"), a series of forts and stations spread along the major road systems connecting the regions of the Roman world. These forts and stations ("mansiones") served as relay points and provided horses to dispatch riders (usually soldiers) and vehicles for Court officials as well as dining and resting quarters. The Imperial Guard corps ("Scholae Palatinae") was under the Chancellor's command, as well as the various imperial arsenals located throughout the Empire. The Chancellor had direct control over the Imperial Chancellory, the central administrative organ of the Empire which coordinated the civilian functions of the Empire and provided direct support to the Emperor. The Imperial Chancellory was divided into four bureaus (the "sacra scrinia"): the Clerical Bureau ("scrinium memoriae"), the Correspondence Bureau ("scrinium epistularum"), the Legal Bureau ("scrinium libellorum"), and the Arrangement Bureau ("scrinium dispositionum"). Each of these bureaus supported a Bureau Director ("magistri scriniorum") who reported to the Chancellor. The administration of finances was a chief duty of the Imperial Court. Two officials within the Court were concerned with financial affairs. The Count of the Imperial Treasury ("Comes sacrarum largitionum") was the Empire's chief financial officer, serving in a role akin to a modern minister of finance. The Count oversaw the collection and distribution of Imperial taxes, managing the Imperial Treasury, and controlled Imperial mints, state-run mills and textile factories, and state-run mining facilities. The Count also exercised judicial functions as they related to taxation matters, with no appeal of his decision. The other key financial officer was the Count of the Imperial Estates ("Comes rerum privatarum") who administered the private property of the Emperor and managed all Imperial estates, including the collection of rent derived therefrom. 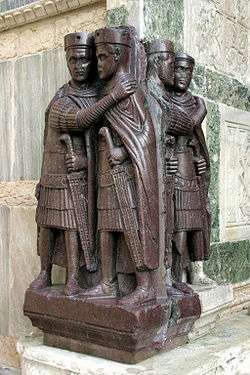 The cities of Rome and Constantinople both were exempt from the control of a Praetorian Prefect and instead were controlled by their own civilian governors answering directly to the Emperor. These two Prefects of the City ("Praefectus urbi") were responsible for the civilian administration of their respect city, presided over their respective Senate, and served as the chief judge for civil and criminal cases within the City. The Prefects commanded the Urban Cohorts ("Cohortes urbanae") and the City Watchmen ("Vigiles") in order to maintain order and security within the city. The Prefect also oversaw maintenance of the city's aqueducts and supervised the markets. One of his most important duties was to oversee his respective City's corn supply. All other provinces were governed by Presidents ("Praeses"). The primary duties of the provincial governors were administrative and judicial. The governor could issues decrees that, if approved by the Emperor, would become binding upon the province. The governor was also the highest judicial official of the province, with appeals heard by the respective Vicar.